16All Scripture is inspired by God and is profitable for teaching, for rebuking, for correcting, for training in righteousness, 17so that the man of God may be complete, equipped for every good work. I love the Lord, and if you’re reading this blog, I am guessing that you do, too. And I love how He changes things up sometimes. And the source of that change-up usually comes from His Word. As I meditated on the verse on New Year’s Day, I began to develop a sermon around it. About 2 weeks later I went back to polish up that sermon to deliver at a nursing home in which we minister. God didn’t polish the first sermon, He gave me a totally different message. I tell you this only as an intro to say that it really excites me that God can give two totally different (yet related) messages on the same verse. It also really excites me that God gives the Word or message that specific people need to hear. When He gave me the first message I anticipated sharing it at our church. It turned out that our nursing home service was scheduled before I was scheduled to preach at our church. I thought I would be sharing a small part of the message I had prepared for our church at the nursing home. God had other ideas He used the same verse but totally changed the focus of the message. How cool is that? God’s Word is amazing. It is what we need, when we need it. I suspect you’ll see bits and pieces of those two messages over the coming weeks, but today I wanted to praise God for His Word. It is good and powerful and life-changing! God’s Word is a light to our path, correction when we’ve made a wrong turn, and wisdom for daily living. That’s easy to say (or write) but it’s not always easy to live. We can’t live it unless we know it and are immersed in it every day. Being immersed in God’s word doesn’t mean simply reading your Bible every day. In years past I have placed a great emphasis in this blog encouraging you to read through the Bible in a year. I still do that personally and I still think it’s something that anyone can do. You can easily read through the New Testament in a year – there are only 260 chapters in it, so the only thing keeping you from accomplishing that goal is setting it – getting over the thought that it is un-doable, finding a reading plan you like (google “Bible reading plans”) and getting started. There are 1189 chapters in the entire Bible. Divide that by 365 days and you learn that you can read through the entire Bible by reading less than 3.26 chapters a day. That’s do-able, too! But I digress. Immersing yourself in the Bible and reading the Bible are two different things. Last year, I decided NOT to read through the Bible. It was actually a hard thing for me to do, but I purposed to read each day until God impressed something from the reading on my heart. Guess what! (Again, I’m digressing, but…) God allowed me to read through the Bible while doing this and I actually finished early! That’s a first! The point is, I wasn’t just reading. I was reading and listening for God to speak – to impress upon my heart some verse or event or concept. Then I was meditating on that. Now, let me be honest – each day wasn’t a “WOW” impression. That would have been overwhelming. But many days He did open my eyes, spirit and heart to something I needed to know. Many times He did highlight a verse as I read and that verse would speak specifically to a need in my life or the life of someone I would encounter in the next couple of days. So, friends – in this first blog of 2018 – written here on the 15th of January (and refusing to feel any guilt about that), I want to encourage you to immerse yourself in God’s Word. Read it, study it, meditate on it. 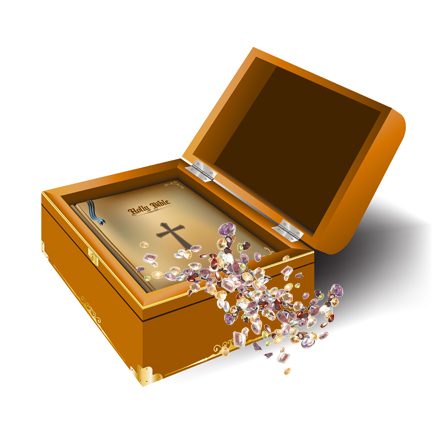 The treasures it will unfold will amaze you. This entry was posted on Monday, January 15th, 2018 at 2:38 pm and is filed under Christian Living, God's ways, Reading the Bible. You can follow any responses to this entry through the RSS 2.0 feed. Both comments and pings are currently closed.